How to change the language for error messages (SSAS) ? Most of the time, you’ll work with an OS installed in a language that you understand. But when you’re working in Belgium, with three national languages and English as a kind of standard for IT communication, you never know if you’ll receive an system installed in Dutch, French or English. Even when the system is installed in my mother tongue, I usually prefer to receive error messages in English: honestly, I usually don’t understand the translated error message. Anyway, if I’m looking for some help with Google or on a forum, I will receive more answers if I query or post with the error message in English than in Dutch or French. 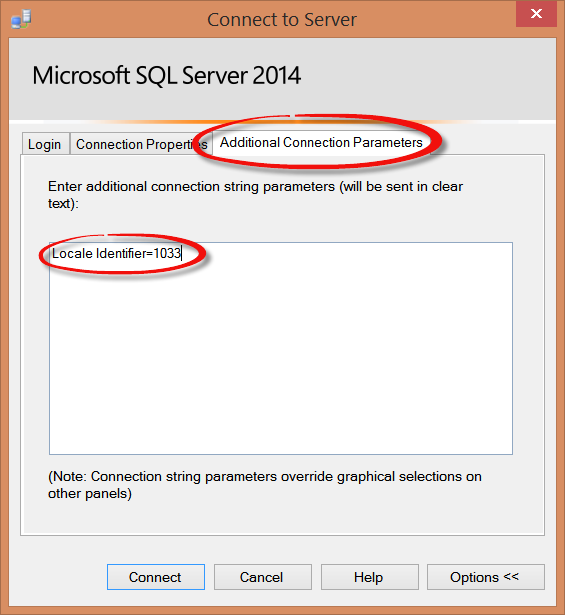 To achieve this, the tip is to provide additional connection parameters when connecting an instance of SSAS. Start by clicking on the tab “Additional Connection Parameters” at the top of the “Connect to server” screen. Then, fill the textbox with a parameter named Locale Identifier and its value (1033 for English) separated by a symbol equal. Once it’s done, just click on “Connect“. The previous query will generate an error in English and not anymore in French.